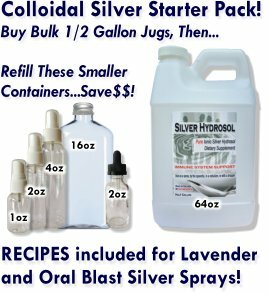 Colloidal Silver Hydrosol - Pure Ionic - Nature's Anti-biotic! 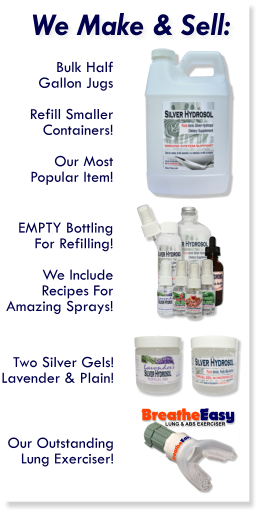 Welcome To Our Silver Hydrosol Store! Silver hydrosol is nature's antibiotic as it has anti-bacterial, anti-fungal, and anti-viral properties! For thousands of years of recorded history, silver has been used as an antibiotic (and food preservative) long before the pharmaceutical industry created manmade ones (and we all know how that is working out as pathogens are becoming increasingly resistant to them). Colloidal Silver Hydrosol is also thought to help rebalance energy in the body, perhaps allowing our biology to heal itself better and easier. Silver is known to have unparalleled conductivity, which is why it is used in electronics and elsewhere. It simply has no equal. More and more health-conscious consumers are rediscovering the power of silver in the form of Silver Hydrosol as a safe, non-toxic, alternative much like shifting to organic foods from processed ones. Our mission is to provide Silver Hydrosol products at affordable prices to make this gift of nature accessible to everyone! We do not skimp on quality, instead we keep our overhead to the bare bones while selling directly to you, our customer. Enjoy our wholesale prices! Please be sure to browse any customer feedback reviews at the bottom of many pages. And if you have any stories you would like to share, please do so! We would love to hear from you whether you're a customer or not. Our company and products are part of an overall effort to make more and more people aware that within Nature are so many of the remedies and nutrition we need to live with health and happiness! These products sell themselves...excellent quality at excellent prices! You will see all across our product pages our desire to deeply discount our products for volume purchases. Most of our products have a Buy 3 Get 1 Free offer. Our commitment is to make products that improve lives for a prices that are sustainable! Enjoy your visit! Please be sure to contact us with any questions! Enjoy your visit! Let us know what you think! Please feel free to contact us using the Contact page for any inquiries! Again, we are passionate about colloidal silver hydrosol and health in general! Please Enjoy Our Video About Happiness? We are building our sister site called "Connected Happiness" at www.ConnectedHappiness.com! Still have a lot of building and polishing to do but our first video is up on YouTube and ready for primetime! Do you have a great story about this? Please share it! Colloidal Silver is my first line of defense! Your Colloidal Silver Hydrosol works wonders for so many uses! Silver hydrosol is a life saver!!! "After using this colloidal silver for a few days, I noticed my mental clarity improved dramatically! I'm ordering more today!" I have purchased and used Ron's Colloidal Silver product. It is SUPERIOR to anything I have used in the past. I used it all through the holiday weekend for bites, cuts, scrapes, disinfecting, and ingesting orally. Once applied there is no swelling, inflammation, itching, etc. It's like in the movies when something heals almost instantly. To keep yourself healthy and your immune system strong for what's coming in the near future I highly recommend you stock up on this. It is a true value and of the highest quality. Please do this for you and your families.